Hi, everyone! Barbara here with a CAS card for you today. First of all, let me echo Kim when I say how fabulous all the eTeam projects were on re-launch day! OMGoodness, what inspiration! I, for one, am really looking forward to seeing what these talented ladies come up with in the future--how about you? And, I want to thank Kim for including me on this amazing team as she starts this exciting journey. And that's it for me today--thanks so much for stopping by! Be sure to check back tomorrow to see what the uber talented Broni has for us. I can't wait to see it--it's sure to amaze! Wow, Barbara, that burlap rose certainly does make an impact! It's great and I LOVE how you featured it and made it truly the focus. Fabulous card!!! 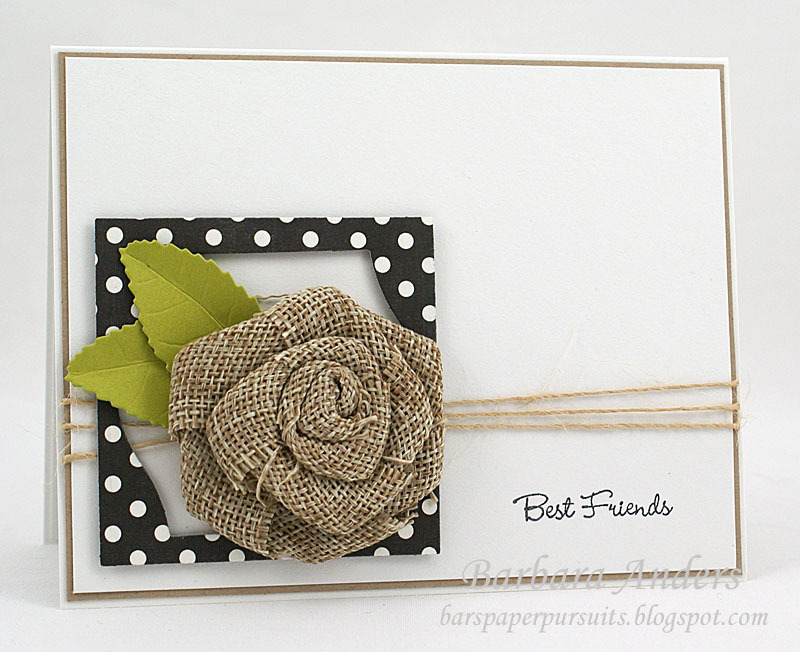 Hi Barbara, I love your card and the burlap rose is outstanding. Wonderful to spend a little time here. Beautiful card, Barbara. Love the burlap flower. Stunning Barbara! Combining the burlap with the polka dots and twine is just perfect! Love this! Wow.... absolutely gorgeous. I love all that white space and the burlap rose is definitely awesome. LOVE it. Oh, so pretty! Love the lovely flower Barbara! Welcome to the new eP! !